Fallout 3 starts out with you in Vault 101, with Liam Neeson as your dad. You grow up through a few events in the game, starting from your birth, where your mother dies. Then just as you're old enough to be a real person, dad breaks out of the vault and turns everything upside down. The whole place goes crazy and the leader (bearing the title of "overseer") of the vault seems to blame you for the trouble. So you escape into the wilderness of a nuclear wasteland Washington DC to find your father. The main plot, as thin on the ground as it is, first involves you trying to track down your father. So you head to a radio station because the broadcaster apparently knows your father, who tells you to head to Rivet City (a town in an aircraft carrier) to speak to a scientist there. That scientist then directs you to find a vault in the wilderness where your father was headed. He's attempting to restart "Project Purity" in the Jefferson Memorial building which will remove the radiation from the water in the tidal basin. You end up rescuing him from a virtual reality program in an abandoned vault. It's "The Matrix" meets "Pleasantville"
Re-united with your father, you return to the Memorial, where soldiers from "The Enclave" have taken over. 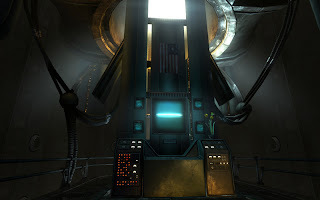 They are apparently the game's true villains and as a result of this encounter, several Enclave soldiers and your father are killed by radiation in the main chamber of the device. The player must then escape from the Enclave and ends up meeting with "The Brotherhood of Steel", who oppose the enclave. 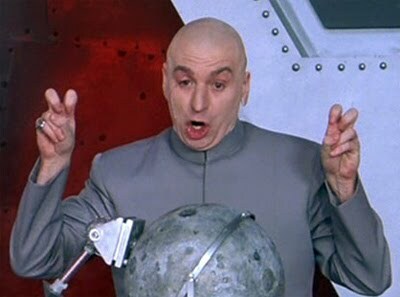 You end up collecting a "technological macguffin" to enable Project Purity to continue. However, after collecting it, you're captured by the Enclave and meet its leader "President Eden", who is actually giant computer. Eden asks you to "poison" the water when you purify it, so that it kills off anyone/anything that has any sort of mutation. You take the vial, and in all likelihood either convince Eden to self destruct, or program him to do so. However, the second in command, Colonel Autumn, takes over the Memorial again, forcing you to enlist the help of the Brotherhood of Steel to capture it. With the assistance of their giant robot, you break into the facility and then kill Autumn in the shortest boss battle of all time. 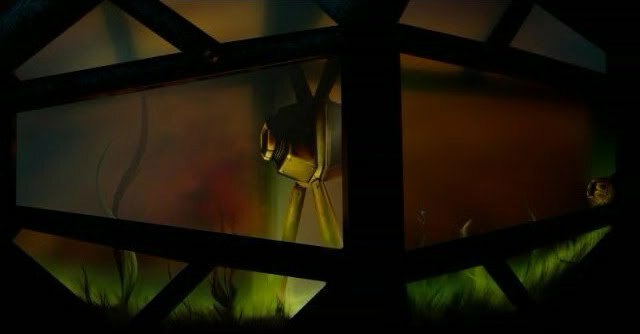 However, the chamber is damaged and filled with radiation, so you or someone else has to die in order to purify the water. It's hard for me start with where I dislike this game. For one, you can short-circuit much of the start of the main plot by simply stumbling onto the vault in which your father is located. And given this is an open world game, that's entirely possible. That said, going through various areas in a "find your father" quest is fairly unsatisfying anyway. But the main plot on the whole is fairly tedious. The "enemy" is the radiation and the hordes of monsters, so you're more fighting for survival than any greater purpose. Fighting to live isn't a bad reason, by any means, but it's not really that gripping. 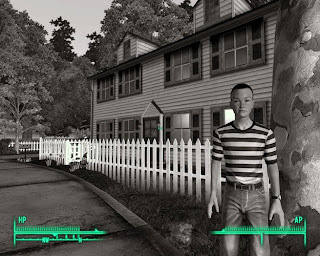 When I was finally introduced to the game's real antagonists, "the Enclave", they just seemed so dull. They're at war with The Brotherhood of Steel, who have helped me before, so I guess they're my enemy by association. Oh, and then they kill my dad. Fine, I can hate them for that. The problem is that they're so very boring. They're basically Stormtroopers covered in rust. If I wanted to kill Stormtroopers, I'd play a Star Wars game. Autumn is a boring and one-dimensional sidekick villain who may as well be nameless. Then we have Eden, the computer brain behind The Enclave. Convincing him to self-destruct or shut down the Enclave might seem like a good design idea, in the great vein of talking the enemy down. Unfortunately, the delivery is sadly lacking. The dialogue behind the exchange is weak and thus largely destroys any impact it might have had. Some might say it's an open world sandbox game, so I shouldn't expect an epic main plot. That the game is about exploring the world and the environment. That's fine, except much of that environment is also interminably dull. Yes, I get that it's a nuclear wasteland... but that doesn't mean it's not dull to explore a world that's got the Quake and Morrowind colour palette of 32-bit brown. There's a whole lot of fetch quests and lots of places that offer little more than "dungeons" with enemies. There's a distinct lack of plot throughout much of the game. Don't get me wrong, there are some good quests, but they are sparse in a game of this size. Even the NPCs are mostly dull. Your interactions with characters are very limited and there's no real meaty dialogue trees to explore. You do get the opportunity for some "party members" aka followers, who you can interact with to a basic degree. However, this is what caused the ending to irk me so much. 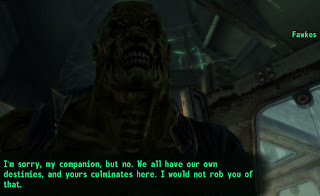 Fawkes, a gentle and friendly supermutant, who is out to do good in the world, refuses to enter a chamber filled with radiation to purify water because, "it is my destiny". It is apparently my destiny to die needlessly, despite that Fawkes is both a good character, and calls me his friend. 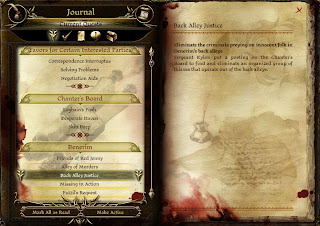 I don't even care that this was "fixed" in a DLC, it should have never existed in the first place and is probably my most hated piece of writing in an RPG or computer game ever. And that covers a lot of bad games. 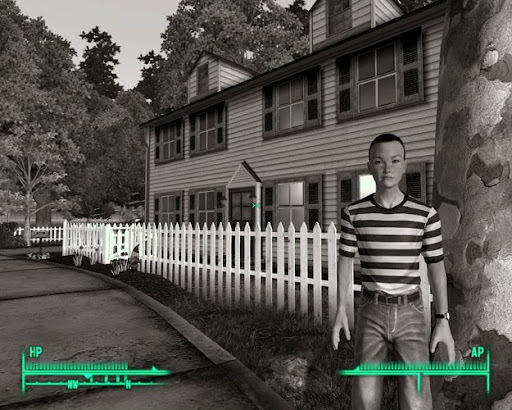 Some might argue that the antagonist of the game is man itself, and the desolation that humans caused to create the wasteland of the game's setting. I'd argue that's a load of poppycock and that as a computer game, Fallout 3 needs an actual antagonist, because it doesn't have one. If it sounds like I'm annoyed, it's because I am, even this long after finishing the game. The hype around Fallout 3 before I played it had told me that it was fantastic and truly delivered a great experience. I went to Washington DC in Fallout 3 and all I got was this unnecessary suicide mission. 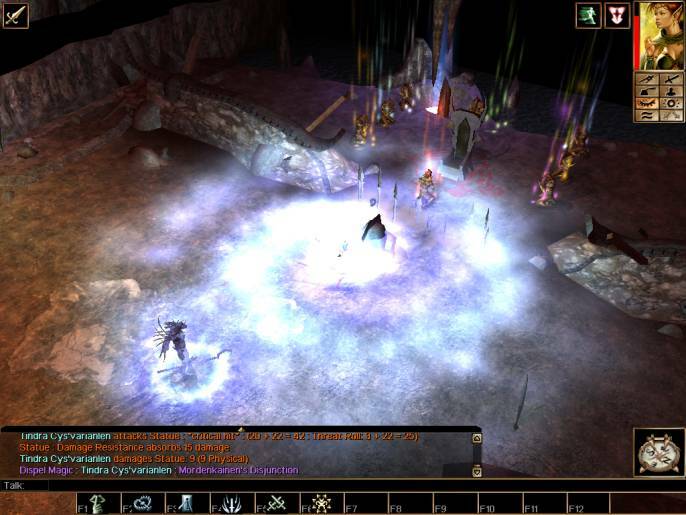 Neverwinter Nights 1 was BioWare's first game that came with a toolset. Now, it wasn't the first RPG game I'd modded, as way back in the days of the 486 I'd dabbled with a 2D RPG creating toolkit. Admittedly I was in primary school at the time, so didn't produce a masterpiece, but it certainly gave me a taste for making my own game worlds. So NWN held a great deal of promise for me. Unfortunately the original campaign left me a little disappointed, and that was in no small part was due to the mediocre antagonists... spoilers to follow. 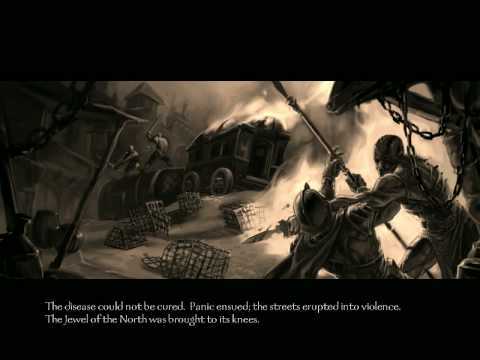 The game starts off with a plague killing off many people in the city of Neverwinter. You play a young adventurer academy recruit undergoing basic training, and you graduate in a ceremony attended by Aribeth de Tylmerande, a famous elven paladin. Yet suddenly you're plunged into a battle as enemies assault the academy, which for some reason is being used to house creatures to be used in a cure for the plague. Why they're stored in a recruit academy and not protected by trained soldiers, I'll never know. Regardless, the creatures escape and are quickly distributed across the city. As a result, it comes down to you to track them down. "You, brave adventurer, must find the magical macguffins to cure this plague!" So you collect the four creatures (or the relevant ingredients from their corpses) for a cure, but they are immediately stolen by a traitor named Desther whom you then chase. Upon capturing him and returning to the city, his friend, Fenthick, who is also Aribeth's lover, is put to death. Unwittingly supporting a traitor is apparently sufficient cause to be hanged. As a result of this escapade, you leave the city to find out information about the cult behind the attack. Your investigations eventually lead you to someone called Maugrim and "The Old Ones", an ancient powerful race attempting to return and conquer the land. 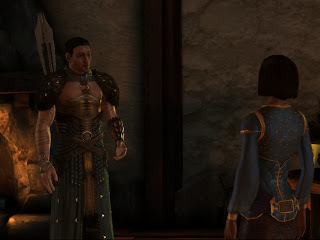 Aribeth's bitterness at Fenthick's treatment along with the magic of the Old Ones cause her to betray Neverwinter and join her former enemies. Thus it is then up to you to find four "runes of power" which will prevent the Old Ones from returning. Yes, that's right, both the first and third acts of the game have you collect four items to further the plot. 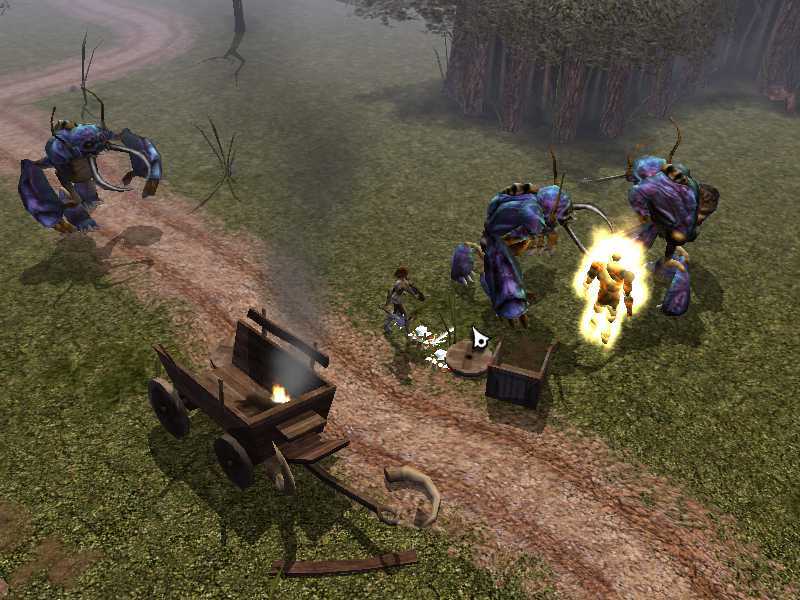 More giant bug beasts... wait, who is the antagonist again? You spend the entire third act running around defeating a myriad of enemies in bizarre situations that actually have nothing to do with the Old Ones. 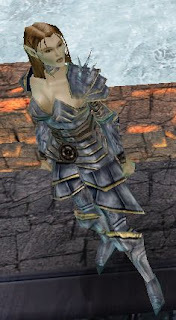 Yet no sooner have you collected the runes and sent them to Neverwinter for safekeeping than Aribeth assaults the city, paving the way for their invasion anyway. Thus you must defeat Aribeth, Maugrim and finally travel to the dimension in which the Old Ones are imprisoned in order to defeat their leader and save the day. Ahhh, the bad guys. The ones I haven't seen for an entire act. I forgot about them. I have several problems with the story, from Fenthick's trial to the repeated "magical macguffin" finding main plot, to the fact that much of the plot revolves around Aribeth and not the player. But one of the biggest issues for me is that the antagonists are so muddied and weak. It's Desther, then his cult, then Maugrim, then Aribeth, then the Old Ones... yet none of it makes any sense. The secondary antagonists have at best slim reasons to follow the Old Ones, and your actions in all but the last act have very little to do directly with those antagonists. Those alien features must ooze charisma to wannabe villains. In the first act, the cult causing the plague virtually has no involvement in the location of the animals except for setting them free in the first place. In the second act, you spend all your time investigating the cult, but do very little to actually track or combat its leader. 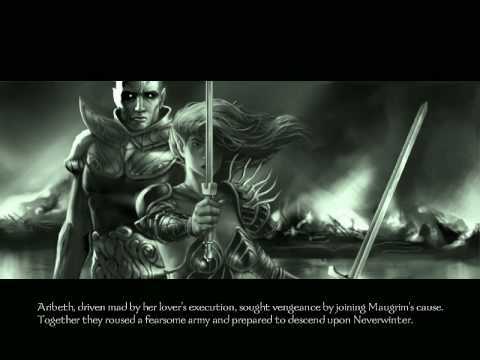 What's worse is that Maugrim is introduced in the second act, but you don't face him until the last, and the same goes for Aribeth with her betrayal. The third act is then entirely about collecting the "macguffin" runes, but you don't deal with your antagonists at all, so it just feels like a pointless distraction. Only in the fourth act, which is very short, do we actually start dealing directly with the antagonists. All the three major antagonists were saved for the last 5% of the game, and as a result, you don't really care that much about any of them. 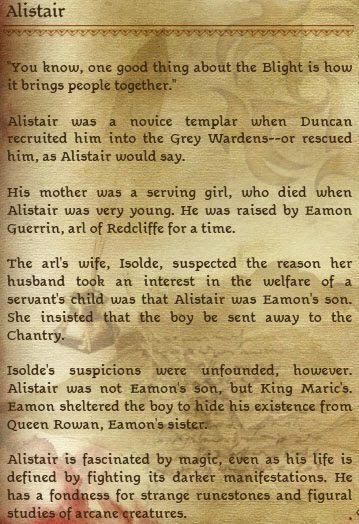 The reasons for Aribeth's betrayal are shallow, Maugrim is a mindless servant to an evil power yet lacking any motivation whatsoever, and Morag (the Queen of the Old Ones) is just a vanilla "destroy and rule the world" villain with absolutely zero character depth. Your enemies are so one-dimensional that it is hard to muster any significant degree of anger towards them, and your collective ire for the three of them is so diluted that it lacks any potency except for the desire to finish the story. The game pitted you against a great evil, but never gave you a personal reason to want to defeat it. Certainly, wanting to save the world from the Old Ones is a noble cause that you want to achieve (unless you're an evil mercenary type, in which case you're only doing it to save your own skin), but there's very little to make you personally invested in it. The only way you could have a direct link with the antagonists was if you were romancing Aribeth, but even that felt very tenuous. Without that personal connection and drive to want to see your enemies defeated, the climatic battle felt more like a showy letdown lacking substance than the epic battle with the forces of evil that it was made out to be. The antagonists are one of the major failings of Neverwinter Nights. 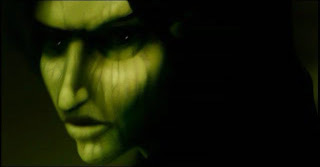 The player is forced to want to kill the antagonists simply "because they're evil", and the antagonists have virtually no motivation beyond "I'm evil". Their irrelevance to much of the story and their complete absence in major portions of the plot mean that even when you do finally meet them, you don't really have any reason to want to defeat them. As such, they make the entire game, and particularly the ending, flat and lacklustre. Now, I know what you're thinking... Thief 2 isn't an RPG. No, it isn't, but I feel that from time to time I need to remind people that I do actually play games aside from RPGs. I think I would actually have to rate the Thief games my favourite computer game series. I must also say that another huge favourite of mine is the Prince of Persia series, well, the Sands of Time trilogy. I haven't played the last two, nor been inspired to do so based on reviews. But, I'm meant to be talking about game antagonists, not my gaming habits. So, requisite spoiler alert for Thief 1 and 2. Thief 2 begins with a crackdown on you and thieves in general, and pits you against a Sheriff Gorman Truart who is trying to get rid of all criminals in the city. Given you're a thief, that's bad for business. As a result, you start going after the Sheriff himself, only to find that someone beats you to punch. Suddenly, the real danger is presented as a group called "The Mechanists" a fanatical religious group led by someone called Karras. At this point, you're actually accosted by Viktoria, an antagonist from the first game. Viktoria is part woman and part plant/tree spirit, and has the power to command trees and plant life. Using these powers, she actually plucked one of your eyes out of your skull with vines in the first game. This is why Garrett has a mechanical eye with the ability to zoom in on objects, to replace his stolen eye. Needless to say, Garrett isn't happy to see her, but despite the past relationship, they reluctantly agree to work together against a greater threat. Karras was the one pulling the strings forcing the sheriff to do his dirty work. While building an army of steam-powered robots with the help of his followers, Karras found a means to turn the criminals Truart captured into robotic slaves, which are distributed to the homes of the wealth to act as obedient servants. Ultimately it is revealed that Karras has found a means to produce a gas which turns organic material into rust in a self-sustaining reaction. In an act of true fanatacism, he believes that cleansing the world of all organic life except for him and his robots will pave the way for his deity "The Builder" to cause the world to "ascend" to glory. Biological weapons are a novelty in a steampunk setting. So Karras plans to seal himself in "Soulforge Cathedral" while the servants release the gas across the city. The homes of the wealth are where so many of the plants are, so the reaction will continue and consume everything. Viktoria hatches a plan to draw the servants back to cathedral and place plants there and seal it off so that Karras destroys himself instead. Garrett disagrees, but is convinced to help after Viktoria assaults the cathedral alone. Viktoria dies in the process, but Garrett vows to finish the mission. I guess Karras and Magneto go to the same helmet shop. The odd thing is that you never actually encounter Karras directly. You do see him in paintings or the game's cutscenes, but the best look you get at him in person is a small glimpse in the final level. So Karras an antagonist that you never fight directly... but in truth, that's fitting, because Garrett isn't a warrior and neither is Karras. 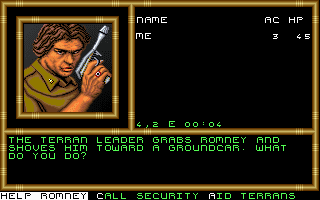 However, like Arcanum, he's not really the driver of the game until later. Your initial perceived enemy is Sheriff Gorman Truart, and Karras only because the villain later. Even then, you have no real idea what he is up to until the briefing before the final level, possessing only the knowledge that it is likely to be bad news. So why is it when you're doing that final mission, you've developed such a passion to make sure Karras is eliminated? I believe it is because of the way he's introduced and painted throughout the game. The first time you encounter him, he is preparing to blackmail the sheriff and is creating his slaves from the "lowlifes" that Truart brings him. After meeting with Viktoria, Karras leaves a message taunting you in his Angelwatch Monastery, and sets the whole place on high alert, making your life very difficult. All the robots speak in "his" voice, and his emphatic zeal and devout insanity all give you a villain that you want to defeat. Even Garrett, who is typically not one for violence, gives the distinct impression he wants to get rid of Karras not just for the sake of the city, but also to avenge Viktoria's death. The final level also sees him taunt you frequently through his loudspeaker system, just furthering your desire to see him defeated. Karras turns out to be a highly memorable antagonist because of the way he's presented. You really get the impression that he is a crazy zealot who believes what he is doing is the right thing, but you never really feel sorry for him. He really is a murderous villain, but the morals he espouses through his words and actions let you know that he is so deluded that he believes he is only a holy mission, but also that you have to stop him. His nasal voice and insane ramblings left a lasting impression, and for me he ranks as one of my favourite game villains. The game starts with you in a zeppelin that is shot down by flying machines. You soon find out that your character is supposedly the reincarnation of Nasrudin, a historical figure who long ago defeated a villain named Arronax. Your return is meant to be the portent for an upcoming clash between the two once again. Yet it takes a long time for the entire picture of the situation to form, and you progress the plot slowly through a series of intermediary steps beforehand. First you try to find out why assassins want you dead, then discover a plot of a missing dwarf clan, who you eventually discover have been banished to "The Void" in order to weaken the barriers between the world and The Void to facilitate Arronax's return. Arronax himself even turns up as a magical projection to taunt you that you will be unable to stop him. It's later revealed the Nasrudin never died... and you even get to meet him. Arcanum is a strange game in that throughout the entire you're led to believe that your antagonist is Arronax until the very end, at which point that notion is turned on its head and reveals your enemy is actually Kerghan, a necromancer. 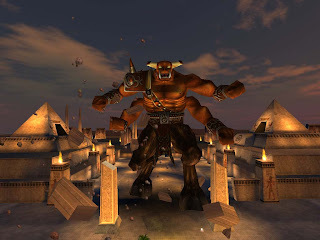 During the game, you did find out information about Kerghan and a few other powerful individuals that played a prominent role in Arcanum's history. This meant that despite you being sprung with this turn of events, you still felt as though you knew a little about your ultimate enemy. Howerver, your supposed antagonist, Arronax, turned out to be quite different from what you expected. He regrets his past misdeeds and offers to assist in defeating Kerghan. When you meet Kerghan, he states that he believes that death is the natural state of the world; that life is an abomination and souls cannot be at peace unless they are dead. One of the great aspects of this final encounter was that you could actually convince Kerghan that he was in the wrong. Having the option to defeat the final antagonist of a game through dialogue instead of combat is a fantastic choice in my opinion. It terms of antagonists, it's actually hard to judge Arcanum. 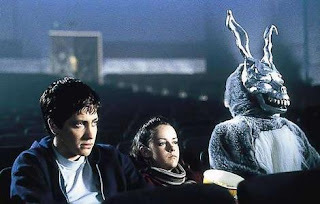 You're posed with a greater evil in the background, but your struggles earlier in the game don't appear to have a connection to him, despite the knowledge that there must be one somehow. Unfortunately, the missing information weakens the strength of your dislike for your perceived antagonist somewhat. It can feel like you're moving towards a far-off confrontation, but no real knowledge of why you're doing so except to advance the plot or because it is your supposed destiny. 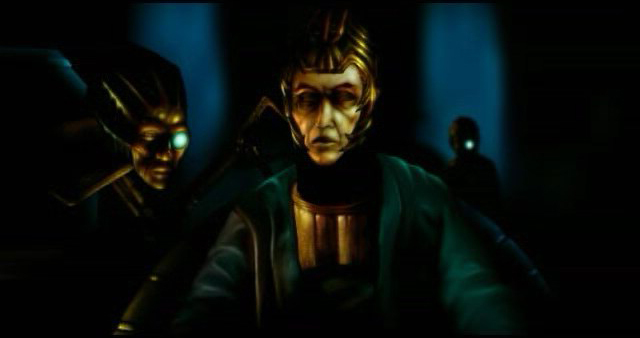 Overall, the antagonist in Arcanum provides some interesting points. 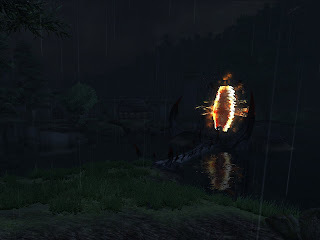 While it does not possess the strongest antagonist in terms of driving you towards the finish, at least not until the later stages of the game, the reveal of the real enemy made the final confrontation an interesting proposition. As such, it's a game that is not really driven by its antagonist, but instead by developing the plot and the history of the world. 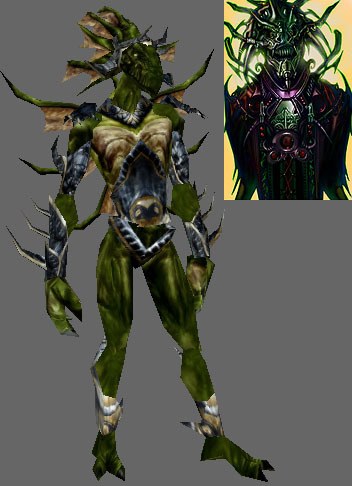 Kerghan feels less fleshed out as a character than Arronax, and if you're like me, you probably felt a bit confused as to how it tied in with some of the prophecy delivered in the game and what it was describing. So strangely enough, despite being a great game, Arcanum's antagonists, both the decoy and the real one, are not really that strong. You don't feel terribly driven to finish the game at their behest, mainly because it takes a long time before you actually understand their involvement within the plot. Yet it is that same plot that places all the pieces of a puzzle together in an magnificent landscape of lore to make the ultimate outcome satisfying anyway. Baldur's Gate gives the player a fantastic antagonist. Right from the opening cinematic, the player sees the game's villain, Sarevok, though you don't find out his name until much later. You do, however, encounter him as a mysterious armoured figure who cuts down your father figure in front of your eyes. So running scared, you escape from this antagonist... certain you will have to face him before the end of the game. Shiny, spiky armour... it's one way to attract attention. But you flee, and start looking into the troubles within the region at the behest of some other travellers. As you progress through the game, you uncover a plot to poison the iron ore of local mines, which is part of a greater plot to control the trade of iron in the region. Through your actions, you become known to those behind the plot, and they send assassins to kill you. You slowly make your way through the lower ranks of the conspiracy through various trials and difficulties, and eventually uncover that an organisation called the Iron Throne is the mastermind of the plan. It turns out that this organisation is led by Sarevok's father Rieltar... thus it appears he is to blame. Yet Rieltar, his second in command are in your childhood home of Candlekeep. You can then either kill Rieltar and his offsiders or be framed for their murder... Sarevok will kill his father and company himself if you do not do it! You are both children of the (dead) God of Murder, and he means to kill you. 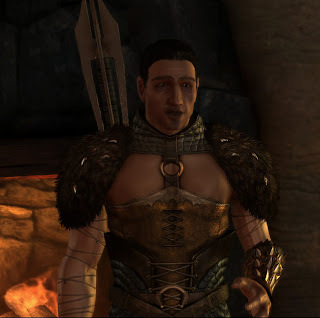 It is soon revealed that Sarevok plans to plunge Baldur's Gate into war with the nation of Amn... and subsequently that he wishes to do so in order to have a war of sacrifice believing he can become the new deity of Murder. As a player, you're very happy to defeat Sarevok in the final battle of the game. Not only did he kill your foster father, but he helped mastermind a crisis across the entire Sword Coast through his lackeys. You fought and defeated all of them along the way, and endured many attempts on your life at their hands. However, Sarevok wasn't fully aware of all those attempts, so you didn't get the impression he didn't consider you a threat. He didn't really underestimate you until right at the end of the game, and even then, he pulled so many strings to get you out of the picture it made it really seem as though he was trying. After all, this is someone who came for you personally right at the start of the game. This is what made Sarevok a great villain. So often the player's character is ignored as "an insignificant threat" by the main villain, and we must prove them wrong as they send a series of ineffectual lackeys, each slightly more powerful than the last until we finally possess the power to defeat the villain themselves. For starters, this is a cheap plot device. Secondly, if someone if making a nuisance of themselves to the villain's plan, they're not going to remain idle, they're going to ensure that person is stopped rather than letting them grow in power. When Sarevok finally heard of you again after the first encounter where you escaped, he pulled out all the stops to ensure you couldn't prevent his plans. Ultimately he failed, but he made you really want to defeat him. That is the hallmark of a good antagonist, and a significant part of what made Baldur's Gate such a great game. I've decided to start a series discussing antagonists in games, in order to detail the impact they had on the game and what made them great. Because RPGs are basically my favourite genre, and have some of the best antagonists around, I'm going to start with an old game I've mentioned previously: Matrix Cubed. In these series of posts, there will be significant spoilers, so if you haven't played the game and don't want the plot spoiled (though that's unlikely in this case) then tune out! Matrix Cubed is a gold box game, a science fiction RPG in the reality of the hero Buck Rogers. This is the sequel to Countdown to Doomsday, where the organisation RAM (Russo-American Mercantile) attempted to build a giant laser and sieze control of the entire solar system. Your party destroyed the laser and saved the galaxy. Everyone lives happily ever after, right? Wrong. Matrix Cubed picks up soon after that, and you're helping broker a treaty on behalf of NEO (New Earth Organisation) with the ruler of Mercury, when RAM assassins attempt to strike. From that point, you're drawn into a skirmish with RAM again, but this time a human supremacy group called PURGE becomes your new enemy as well. You're soon approached by a scientist about a wonderful scientific device called the "Matrix Device" which can transmute elements, and seems to be the solution to the terrible pollution that is suffocating Earth. However, this scientist is kidnapped by the PURGE leader named Sid Refuge, and you attempt to get him back and have your first altercation with him. He treats you obnoxiously unless you actively aid him, but a showdown soon ensues regardless. From this point onward, he and PURGE dog your every move, and even though you defeat him several times, he always manages to limp away from the battle somehow and return stronger. Replacing his damaged body parts with cybernetic enhancements, he refuses to die and constantly hounds you and even manages to get all of the same information that you do. This would not fly in a modern game where you get to see your enemies die in "realistic" combat, but it worked wonders for developing PURGE and Sid Refuge as dire enemies despite the fact that you managed to thwart their plans in most cases. But it was never quite enough to completely put them out of the picture. The reason his "return" each time was not too jarring was because it was always noted very soon after the battle (if not immediately after) that Sid had escaped or otherwise could not be found. You thought you had been victorious, but then found he had got away yet again. It became a source of frustration but also expectation, because each time you had an increasing desire to be able to finish him off. Every move he made was more ruthless than the last, giving you more and more reasons to want to defeat him permanently. This is why the final battle, where you defeated Sid Refuge one last time, and an NPC finally ensured his doom by trapping him inside the crucible chamber of the Matrix Device (reaching thousands of degrees in temperature) felt like such an achievement. An antagonist that had been frustrating you and maintaining an even footing through underhanded means despite you succeeding at any tasks placed before you provided a great sense of victory at the climax of the game. The antagonist you cannot defeat permanently in your first battle is a foe that truly gives you satisfaction when you actually best them. Those that hound and taunt you as a result of your inability to defeat them just encourage your desire to win, and increase your enjoyment when you finally do. There's been a growing trend in RPGs to tend towards stronger NPCs. No, I don't mean physical strength, I mean in terms of the depth and complexity of their character. By making the characters that the player interacts with more compelling and interesting, the aim is to draw the player in more. However, given that there are a limited amount of resources when creating a game, where should the line be drawn in terms of developing a character? I will note that this isn't a problem exclusive to RPGs. Any plot driven story needs to balance the development of its characters with the development of plot itself. However, I think I'd argue that RPGs tend to be more gripping when they revolve around the plot. This is because the RPG is the player's story. It is the player's choices and decisions that cause events to happen. If their actions don't have the most important effects, then the player is relegated to the position of a supporting cast member in the show in which they are supposed to be the star. This was a major problem I had with the original Neverwinter Nights. So much of the story ended up revolving around Aribeth instead of the player that I felt like a secondary figure to her protagonist role. It should be very rare that the player does not feel like the star of the game. Even in the climax of Oblivion's main plot, where the player is not the ultimate hero, they are thanked profusely and made to feel like they indeed the saviour that made the success possible. Which is true, of course, but players need to be reminded of that. Gamers play RPGs to be the hero (or the villain!) and want to feel that they are doing that. The problem with strong characterisation is that it can potentially take away that feeling. So given that point, it follows that we cannot risk the plot itself in favour of characterisation. This is not only in order to make the player feel like the protagonist of the story, but also to ensure that we give the player enough time to experience a suitably epic story. As I said, there's a limited amount of resources when making a game, so making sure the player gets a gripping story should be among the foremost of concerns. As much as people say the "saving the world" cliche gets old... it really doesn't. We've been doing it for years now in games of all genres, and gamers still love it. Regardless of the spin of a story, there has to be something at stake for the player to be invested to succeed in the story. What higher stakes are there than the nation... the world... the universe? Now just to do an about-face, I'm going to say that characterisation is also an excellent way to get players invested in a story. If we care about the people involved, we're going to want to see good things happen to them, or if we're given reason to hate them, bad things! Could we have a game based entirely around a set of characters and their fates based upon the decisions of the player? Would it be memorable, or simply forgotten because it lacked the epic scope of its story-driven competition? Based on the results of my poll, readers appear to be most interested in posts on game design, mod development updates and modding tutorials. Given I've been talking about aspects of game design on a regular basis, I thought I'd put together a little something for everyone eager to hear about The Shattered War. 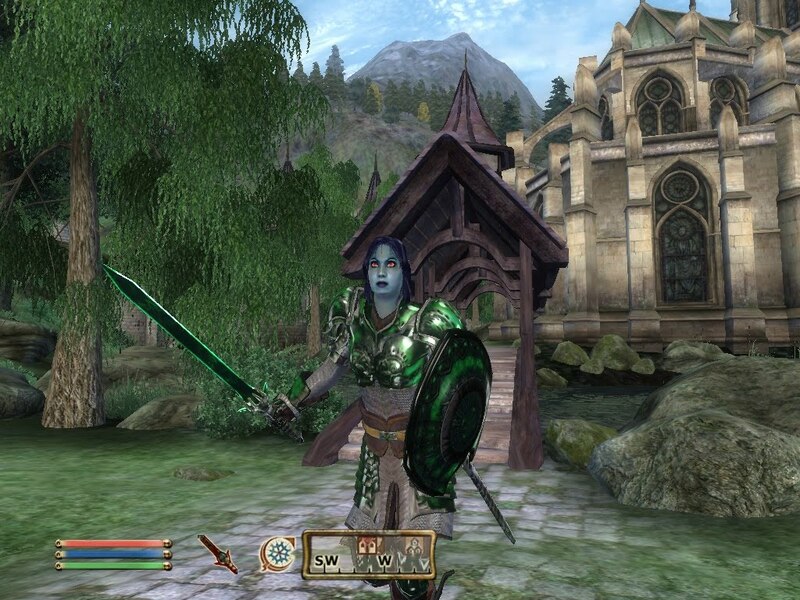 I am Keldrin, mage and Grey Warden, at your service. I grew up under the yoke of the Chantry, feared and ostracised by them and their Templars. But I do not hate them unlike so many others. They do what they do because they rightfully fear the power of magic. They see the potential for great evil and malice, something that exists in the hearts of most. But it is only mages that command the ability to destroy so quickly and capably should they turn their magic to violent means. Yet, I still pity them for being so bound by that fear. That doesn't sound like a pleasant childhood. I was cared for by some and feared by others. When a watchful eye is cast upon you at all times, it is hard to be truly happy. Is it any wonder that some mages rebel under the strain of such constant scrutiny? How did you join the Grey Wardens? A more personal question: How would you describe love? Love? I hardly consider myself an expert on the matter. Yes, I had have dalliances in the past, but I would not say I am experienced. It is not something that can be described in a simple manner, nor should it be. Who am I to attempt to better the poetry or song of great Orlesian bards? A Grey Warden has little time for love, for death may be around any corner. But we must sacrifice our lives to fight the evil that has plagued our land for many generations. Should we be expected to sacrifice the humanity of our emotions as well? And thank you. I hope that we shall see each other again. One of the things that many player never realise is how much time and effort goes into creating the things that players never see. All the things that are necessary in order to make a game what it ultimately becomes. All the drafts, all the planning, all the scrapped ideas, all the background information that never makes it into the game but are there are significant driving forces and inspiration behind the final experience the player receives. I'd hope that regular readers of the blog would have a greater understanding of that due to my posts - if they didn't possess that knowledge already. I'll pick a specific example for this point, namely characters. Most characters within video games will have fairly lengthy backstories created by the developers. This is not just RPGs, even though by necessity they tend to revolve more around fully developed characters and are thus more likely to have larger character profiles. These character biographies provide the game developers with a means to guide so many aspects of that character, from their appearance, their actions, their speech, mannerisms... not just "many" aspects - every aspect. Yet the chances are that the player may never see the information contained in that profile, or at least not in that form. It will be doled out in little bits and pieces, directly and indirectly as the game proceeds until the player builds up the full picture of that character. Do PCs ever get paranoid about others reading their diary? This raises a question of how much does the designer really need to force on the player? I'm not simply talking about the division of dialogue/cinematic versus optional information the player can choose to read or not read, but the choice of whether certain information should be included in the game at all. Do the players really need to be told everything? Can game designers leave some facts and history untold (or in some cases, amibiguous) to allow players to "fill in the blanks" and add in their own spin or thoughts on the idea? Or is this in fact a great design decision, allowing the players room for discussion and interpretation and to create their "own version" of the world of the game that they played? As a reference, I'm going to mention not a game, but a movie. Take the "cult classic" Donnie Darko. Upon finishing, the viewers are left with a myriad of questions as to what really happened and the events and even the knowledge of some of the characters and hence their intentions. There were many differing opinions and many people had their own take on the story. Some time later, a director's cut was released, containing a lot more information and "filling in" many of those holes that caused the ambiguity or discussion. Even for those who were "right", the movie was far less interesting or worthy of discussion. I'm not advocating giant plot holes or characters that seemingly lack any motivation whatsoever. I'm merely saying that players don't need to be privy to everything that happens in the lives of the characters they meet in games. Some degree of mystique is healthy and creates intrigue. PS This marks my 50th post on this blog. I hope that my thoughts have proven interesting thus far, and that I'm able to provide entertaining and thought provoking posts in the future. That's not an RPG! *This* is an RPG! One thing I love seeing bandied about in various places is whether certain games are or are not RPGs. And by "love", I mean "find interminably frustrating". My favourite is recent times in the number of people I've seen complaining "Mass Effect 2 isn't and RPG but Mass Effect 1 is". Huh? What? 1. ME2 is a cover based shooter like Gears of War. Well, its combat segments are... but how is that does that make it less of an RPG than just shooting in the open as was the case ME1? 2. ME2 doesn't have an inventory. Right... because I loved playing pack mule and upgrading my ammo for an extra 5% damage that made no noticeable different to gameplay. 3. ME2 has no choice/roleplay. Wait? What? Are we playing the same game? Squadmates dying, universe changing decisions... maybe we're not seeing the effect of some of those in the game itself, but it doesn't mean those choices aren't there. I'm sure there are more that I'm missing, but if I continue along this line, I won't get to the point of this post. Shooters cannot be RPGs! I am gamer, hear me roar! So my question to everyone is: "How do you define an RPG?" If you look at all the games that have been given the "RPG" moniker over the history of computer gaming, you're going to get a really broad spectrum of games. Dungeon Master, Gold Box Games, Ultima Underworld, Diablo, Guild Wars, the Ultima and Final Fantasy series, Mass Effect... and many more that I've omitted. There are many concepts and elements that combine to make an RPG. The ability of your character to level up, customise their build/skils, change their equipment, to talk to individuals within the world, to progress a story, to carry out side missions or optional objectives, defeat enemies in combat, etc, etc. Many of these exist within other games that are not classified as RPGs. You had optional objectives and the ability to customise your equipment in the Thief series, but no one called them roleplaying games. You can "level-up" and pick new abilities in multiplayer Modern Warfare... and there's a story you experience in the single player campaign... but that's not an RPG either. It has swords and magic. Must be an RPG, right? I'll confess that I'm somewhat of a preaching purist in my definition of roleplaying. I would say that roleplaying in games is largely about "playing a role", i.e. based on your character's decisions and interactions within the game, you define or play a particular persona. As a game designer (can I call myself that as a modder? ), I'd say that providing an RPG demands that you actively provide the player with the ability to make those choices to define that persona. You actively force the player to make decisions that require some thought or will dictate the type of character that they are roleplaying - in modern games, this is typically through dialogue. There are other choices that players enforce on themselves, like not using traps, only wearing matching armor, or any other myriad of "personal" decisions that players make because of their view of the world and characters, but the game designer has no say in these. Some might argue it's not just dialogue, but character development, i.e. 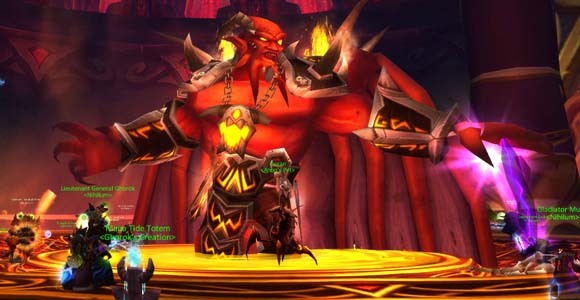 how players allocate the "skill points" of their character - which is how games like Diablo, Demons' Souls and World of Warcraft have the RPG designation. I would say that doesn't actively define your character for anything except their role in combat, so it's not really "roleplaying" as such. I don't consider assigning skill points roleplaying. Time sink, definitely. Fun, arguably. RPG? Sorry, not in my book. 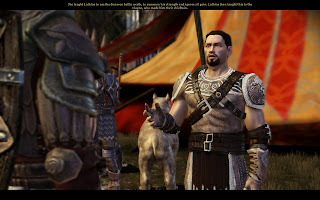 For me, a "true" roleplaying game is where there is a significant amount of gameplay that consists of dialogue choices, and those dialogue choices allow me to roleplay a particular character type. The ability to effect the game world is also becoming increasingly more important, even though I'd still consider it a "recent" trend. Yet I can't dictate my opinion to other people, and I can't deny that many of the games that I don't consider "true" RPGs have RPG elements. That said, I don't pretend I'm not hypocritical to some degree. How could I possibly call a gold box game an RPG but not World of Warcraft? Surely the scope of character customisation and the story through which the character progresses through WoW far exceeds that offered by something like Matrix Cubed? Do I give the gold box game a conceded pass into my RPG "box" simply because it's old? Umm... apparently, yes. Yes, I do. Go figure. I can't claim to have the "one" definition of an RPG that I expect everyone to adhere to, and nor should I expect that. But likewise, other people dictating that "game X" is not an RPG because it doesn't do something that they think it should is somewhat narrow minded. The concept of exactly what makes an RPG an RPG is ill-defined at best. Without game developers pushing the boundaries of that definition and trying to take the elements of RPGs and combine them different types of gameplay, gamers will end up with a stagnant genre. Given that RPGs are pretty much already a niche market compared to the immediately and easily consumable (and as easily discarded) first person shooter and sport titles that sell millions of copies within scant weeks of their release, I want to see the genre evolve. 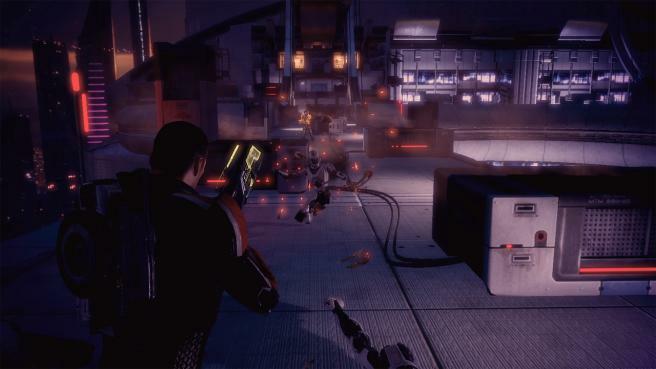 I want to see more games in the genre of Mass Effect, Alpha Protocol. and as much as it pains me to say it, Fallout 3. Don't get me wrong, I love the traditional fantasy setting and engrossing book-series-worth-of-dialogue present in Dragon Age, but it was merely expanding an area in which a pre-existing fanbase was already comfortable. I love BioWare for catering to that market as seemingly only they are able to do at the moment, but without pushing the boundaries of the RPG genre in other directions, they will struggle to attract new fans. New fans and game sales provide funding and hence future titles, so I'm happy to see game studios try new approaches to bring people into the fold. If you love your RPG, set it free. In my second post on ambient behaviour, I'm going to talk about ambient animations. Much like ambient movement, it mostly revolves around setting a few variables on the NPC. Again, much of this is available on the wiki. Note that for each animation entry, there are a number of individual animations that will be performed by the NPC. For example, look at merchant_wander below, which has a total of ten different animations. Upon moving to any waypoint, as stated above, the creature will stop and face the direction that waypoint is facing. 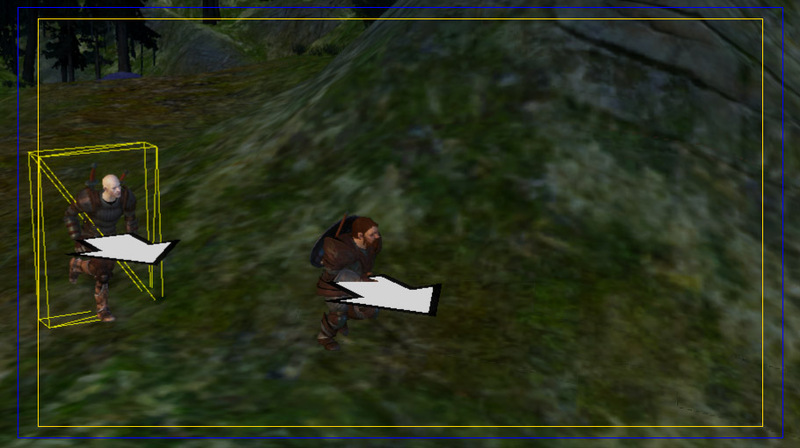 Thus any animation the NPC performs will be done while they are facing that way. If you are using random movement without waypoints, you have no control over the potential direction the NPC will be facing when they deliver their animation. The animation length (including pauses) for some of the animations are very long. This may result in it looking like your NPCs are not moving at all. Now, when a creature stops for its animation phase, by default it will perform each of the animations in the list for the selected animation number in order. For those animations with a green background, you cannot/should not change this. However, for other animations, it is possible to select a random number of animations to play for each animation phase between movement. In order to change this, you set the AMBIENT_ANIM_FREQ variable on the NPC. To quote from the wiki "The part left of the decimal specifies the minimum and the part right of the decimal specifies the maximum number of random animations to play during an animation phase." So a value of 1.2 would play 1 or 2 animations from that animation's list, whereas a value of 1.4 would play between 1 and 4. I have not tested whether it is possible to have a maximum above the available number of animations for the selected animation entry. If anyone has tested this and was able to identify the behaviour, then please let me know! So there is ambient behaviour in a nutshell. By simply setting a few variables on NPCs, you can have the NPCs moving and interacting with others within your mod, creating a background of life and movement. Unfortunately it hasn't been a terribly productive day. I'm constantly learning new things about the toolset, which is both good and bad. This typically results in me making mistakes and taking longer to do something than it should. On the positive side, it does mean that I know the toolset better and in some cases can avoid making the same mistake in the future. I did a reasonable amount of experimentation with ambient behaviour and animations to work out what could and could not be done. I'll be doing a follow up post covering using animations within ambient behaviour in the next day or so. The mistake I made was to do with stages and cutscenes. If you're using a stage for a conversation and then you make a cutscene from a line of dialogue, do not under any circumstance move the stage. Doing so will completely invalidate your cutscene as will no longer map properly to the stage's position the area. The problem is particularly troublesome because it won't show up if the view the cutscene itself, as the cutscene still has the old stage position data. The error will only appear in a preview via the conversation or in the game itself. You may (or may not) be able to identify that the grass and shrubberies are floating slightly. I imagine many players might not notice this, but unfortunately (or fortunately, depending upon how you look at it), I do. This means that I had to go through and check the level for floating vegetation, and I also did a double check of the lighting of vegetation, and noted that there were a few issues on shadow boundaries where adjacent plants had greatly varying brightness due to one being in shadow and the other not. This doesn't look good so I had to fix it. Such is my perfectionist streak. I'll know to be mindful of shadowed areas in the future and either not place plants across the boundary, or fix it with a static light. Finally, regular readers (I'm not sure how many of those I have?) might have noticed the little slideshow widget I've placed into the left pane of the site. This contains screenshots from various mods and levels that I've produced - I'll be looking to add more eye candy to it as production continues for The Shattered War. I recently received an enquiry regarding ambient behaviours in Dragon Age. Ambient behaviours are a simple means of making your world feel a little more alive by having the NPCs in it wander around and perform actions. I'm just going to approach this from a fairly simple perspective, as I haven't delved into the area in detail, but hopefully I can provide some useful information. Firstly, this page on the toolset wiki gives an excellent overview of how ambient behaviours work, but I'll try and add a few examples and demonstrations in my explanation. The first thing to do with your NPC is to set the variable AMBIENT_SYSTEM_STATE. In most cases, you'll just want to set this to 1. There are some cases where you will want to set it to one of the other values (as listed on that page - 2 or 4 for looping animations), but in general, 1 is the setting you'll be using most of the time. 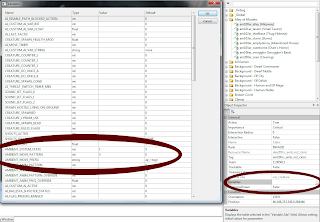 So select your NPC in the area editor, click the variables button and then change that value to 1. The first part of ambient behaviour is NPC movement; getting them to move around a level, imitating the bustle of regular activity. This kind of activity is achieved quite easily. AMBIENT_MOVE_PATTERN is the primary variable controlling movement. It determines the pattern and type of movement that the NPC will undertake. I'll go through the patterns as they're listed in the wiki. These are mostly self-explanatory (though I'll explain waypoint usage). 0 (AMBIENT_MOVE_NONE): No ambient movement - only if you want the NPC to stand still. 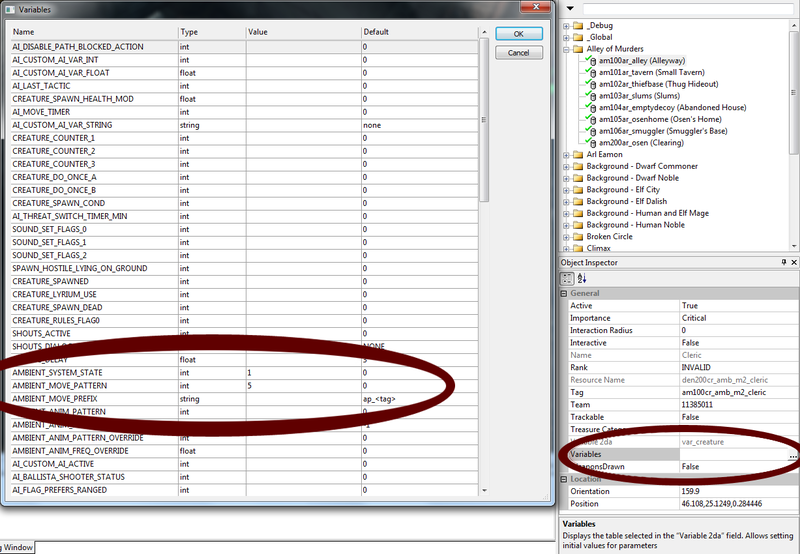 In order to select the desired behaviour, simply enter this number as the value of the AMBIENT_MOVE_PATTERN variable. Also note that you can make the NPC run by adding 100 to that number. 5 and 6 are the two that don't require waypoints, so let's cover those first. These two options are simple. All you have to do is set the variable to 4 or 5, and the NPC will happily wander about the level, either 10 of 30 metres from their initially placed location. When using these waypoint systems, I'm not sure if there is a distance limit on how far away the next waypoint can be. It may be wise not to space waypoints too far from each other. I'm also not certain of the benefit of using 7 or 8 over 1 or 2. Option 9 I believe is what was used for Duncan at Ostagar. After he talks to you in the initial cutscene/conversation of the area, he makes his may to the bonfire and then stops there. So this option allows you to set waypoints to make someone move to a specific location and then stop there. However, you'll likely need to use some scripting in order to make it work properly - as you'll want to activate it after a particular event. If people are interesting in modifying these behaviours via script functions, then I could potentially write a short tutorial on that as well. This has unexpectedly turned into a long post... so I might have to cover the animation part of ambient behaviour another day! Recently I mentioned I was playing Alpha Protocol and I quite liking it. While I haven't changed my mind about that (though I've still not finished it), and I'd still recommend it to people. I'll confess that part of the reason I like it is that it allows me to use stealth. Unfortunately, they have some issues with it. One mission in a US facility saw me receive a post-mission debriefing that I'd killed American soldiers. Yet I'd made a specific effort NOT to do so, incapacitating all of them through non-lethal means rather than getting involved in a gunfight. Another mission in a train station had a particularly difficult section where there were five guards. As I took out each one stealthily, another guard would magically appear to take his place. After I killed or incapacitated 3 guards, the guard that then appeared was automatically hostile (even though he couldn't see me) and alert his four friends to my presence. In yet another mission, my handler warned me of a room filled with guards saying that they might have heard the gunfire... yet not a single shot had been fired. That mission also saw me leave the area by tossing an explosive to dispatch an enemy combatant - which was odd given I'd made my way stealthily through the entire level. Thank goodness people are too stupid to look up. The problem is that stealth players are perfectionist fanatics. If, as a designer, you offer stealth as an option for gameplay, then you really need to set aside a lot of time for testing. Why? Stealth players are going to find a way to "break" your level design in ways you haven't considered. 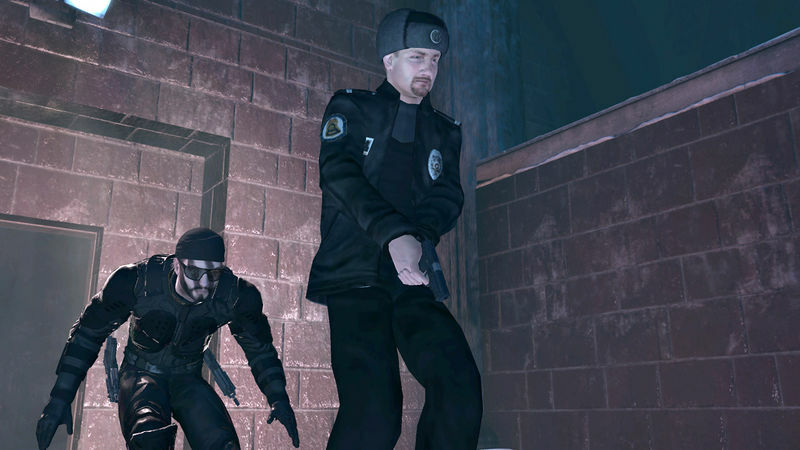 Stealth players will wait for minutes for the timing of patrolling guards to match up so that they can get from one hiding place to another without being seen. When you add in mechanics that allow the player to "go invisible" (which Alpha Protocol does), they will find a way to get around without raising an alarm. What's more, if they do get spotted, they're probably going to reload and try again. And over, and over, and over again, until they get it "right". 1) No guard must see you, or even be alerted to your presence. If they so much as say "Somethin' there? ", that's it, you've failed. Needless to say, trying to finish a level in a game (even one designed specifically for stealth like Thief) in this manner is a significant challenge, and highly time consuming. Playtime's over. Time for bed. 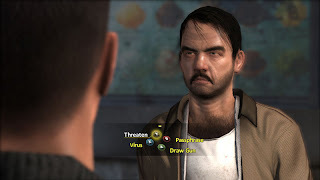 So now I must confess that I'm one of the fanatics who went through Thief games playing as a ghost, which I why I deplore the use of some of the cheap tactics employed in Alpha Protocol. No, I don't expect to be able to "ghost" in Alpha Protocol, though I'll confess I'd love if it was possible. That said, I have no problem being forced out into a firefight in the open. That's fine, because there are some circumstances in which that has to occur. But magically respawning enemies? Unacceptable. The incapacitation issue seemed like a bug rather than design issue, but the assumption that I was going to be fighting my way through one particular level was again unacceptable. However, the highlight (or lowlight?) was the first "boss" I faced. With an objective to reach him without being spotted, I immediately decided I was up for the challenge. Unfortunately, the game wasn't. It took me numerous attempts to figure out a means to eliminate his guards and get behind him without alerting him, but I persevered despite some ridiculous AI quirks. When I finally succeeded, I approached him from behind and pressed the "A" button on my controller to take him out. Only it wouldn't work. This "boss" was immune to an instant kill sneak attack... something that had worked on every single person so far... why was this man immune to death by knife from behind? What's more, is that it didn't seem to be possible to dispatch him in a single burst of silenced gunfire either. Maybe I was missing something, but I could not find any means to dispatch him without him at least being able to turn and return fire for an instant. The reason I considered this such a significant issue is because I was presented with a seemingly unachievable goal. 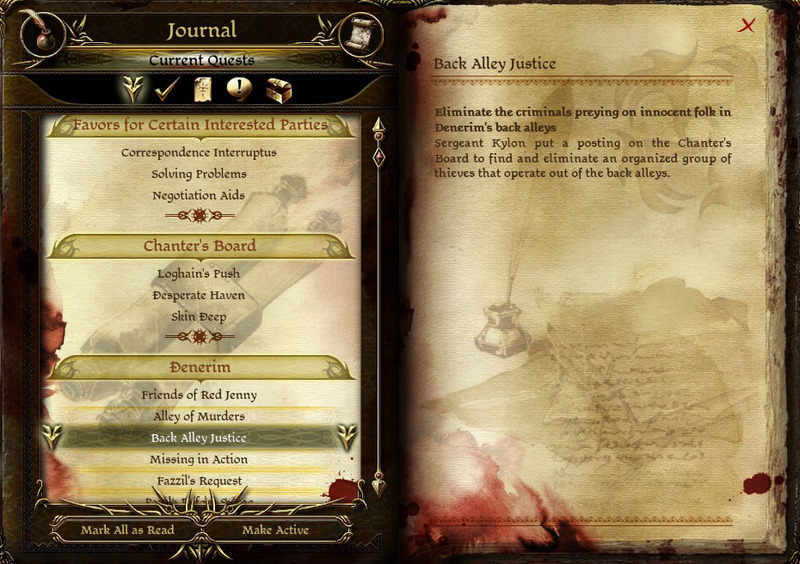 The game explicitly offered stealth as an option, and in this case it was even stated that was the preferred approach. 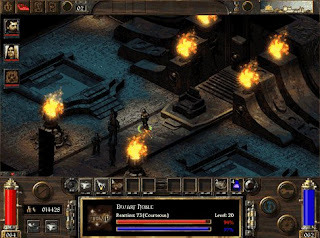 Yet the implementation means that it is not possible to complete using the mechanics that the player is already familiar with and has been using successfully throughout the game up until this point. As a designer, you cannot nullify a tactic presented to the player without a clear indication and reason for doing so. Is the fact that the enemy is a "boss" sufficient to justify their inability to use a stealth takedown? Especially when you're specifically told that you should take him down without being seen? I considered not. Maybe I'm overreacting. Maybe this is just sour grapes because I couldn't stealth my way through a difficult encounter. Or maybe I'm just annoyed because a developer offered stealth without considering the playstyle of a stealth fanatic like me. I've said before that you can't cater for the few for the sake of the many, and I stand by that. My issue is that Obsidian took deliberate measures to prevent stealth from being used, actively preventing a tactic rather than failing to cater for it. RPGs are frequently about the story and the characters. It's the story-telling in an interactive form that attracts so many ardent fans. Whether they're gripped by the epic tale of their character, or if they become enamored with the NPCs (and some players certainly do!) players come to love the reality in which the game is set. But with only a story, an RPG would be little more than an interactive movie. So RPGs cater to the desires of the player to engage in glorious battles, defeating their enemies against overwhelming odds, playing out the fight scenes that would be present were the story simply a book or movie. This not only provides a lot of excitement and challenge for the player, but they also feel more invested in their protagonist because they have take control of their development and directed their actions in epic combat. 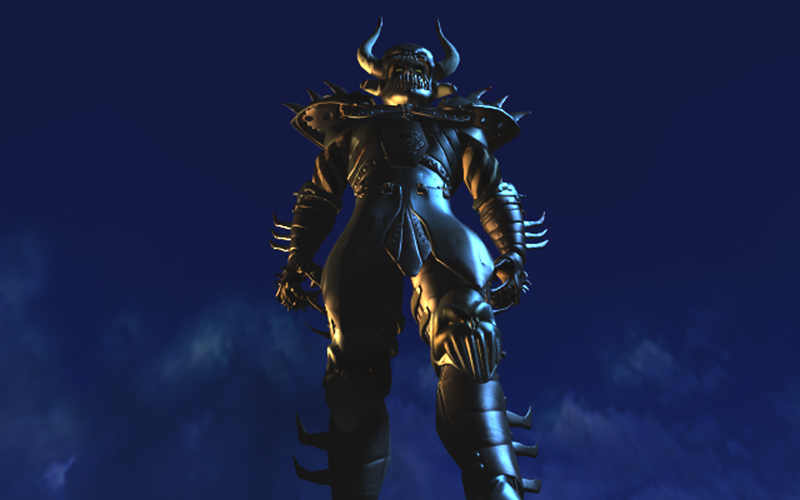 Okay, so he's not an RPG villain, but he is practically the epitome of epic combat. Dialogue and combat supplement each other wonderfully in an excellent RPG. The story provides a rich narrative and world for the player to experience and direct the actions of their character, and the combat raises the tension of their journey as they grow in power and deal with more fearsome and deadly enemies to eventually overcome a great challenge or adversary. Obviously, the first means to balance dialogue and combat is to not inundate the player with too much of either over a given stretch. When the player is getting pressed with a lot of quests and dialogue, throw in a short, sharp combat to break it up. For example, take the encounter with Garrus and Dr Michel in Mass Effect 1. On the citadel, the player gets a serious case of "too many quests" syndrome. Everyone wants Shepherd's help with something, and has a lot to say about it beforehand. 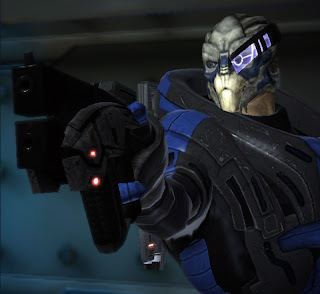 This encounter starts with a short action cutscene where Shepherd's entrance allows Garrus to take a shot in a hostage situation, and then combat ensues. It's a refreshing fast-paced change to the slower dialogue that the player has been experiencing for a little while. Of course, the flipside when you have lots of combat is to simply throw in a conversation or cutscene. This is great because it reminds the players of why they are doing a lot of fighting, and potentially raises the stakes of the conflict. Just like a good protagonist in a movie makes a viewer care about what happens to them, good plot development in a game makes a player eager to prevail against their enemies. Another excellent means of providing players with an optimal balance of combat and dialogue is choice. (Yes, regular readers, I'm talking about choice again) If you actually allow players to pick whether they are going to pursue a quest through diplomacy or simply killing all their opposition, then you win on two counts. Not only do you let the player feel in control of the game (because they are! ), but you also let them decide whether they want more or less combat. This approach will need extra work on the scripting side of things in addition to the work required to produce a dialogue and a combat focused quest, but even a few of these will really add to the player's sense that they are in a "real" world. 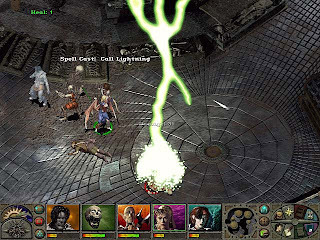 Now, while Planescape: Torment probably isn't the best example of balancing dialogue versus combat (as it had swathes of text you had to read through), it did provide the opportunity to fight or talk your way through numerous encounters throughout the game. The time for diplomacy has ended! While mixing up combat and dialogue is the obvious choice, it is possible to provide variance within the presentation of each to keep them both fresh. For starters, dialogue should never go on for too long without the player being forced to do something, it's a game, not a movie. 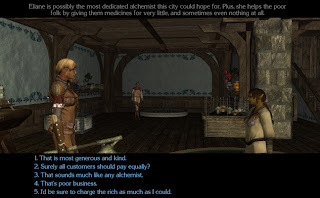 The player should also be forced to make different sorts of reactions, whether deciding how to pursue a particular quest, either sweet-talking or insulting an important NPC, or getting their character to deliver a rousing speech to an audience. Combat can be varied to a great degree by pitting the player against different enemies or forcing them to use different tactics. In my previous post I covered the issues presented by having a lot of dialogue. So now it's time to cover the issues with having a lot of combat. In the final part, I'll discuss the reasons both are important, and some options for balancing the two. Periods of extended combat without something to further the plot or character development are in great danger of becoming repetitive to the player unless something is done to vary the experience for the player. I'm sure you've all experienced this from time to time - too much repetition makes for a boring game. Dragon Age's prime example is The Deep Roads, with lots and lots of combat with very little plot between. Despite a couple of high points with a battle in a t-junction that just wouldn't end and a spider queen that decimated my party several times and forced me to switch up my tactics, the lack of narrative made it drag a little. Another example would be the tedious task of closing Oblivion gates in Oblivion, after the first few, you just ended up repeating the same thing over and over again. Great, another Oblivion gate. Is there some kind of "Frequent Gater Program" I can join? Another bugbear for designers when dealing with combat is the difficulty. For starters, there's the whole "levelled enemies/encounters" debate. For those not familiar with the concept, the idea is that enemies are also around the same strength as your character no matter when you encounter them in the game. While this gives great flexibility to the player in that they can choose where they wish to go, allowing them to experience the game in a different "order", it does have plot consistency issues. Ah, yes. Glass armor wearing bandits. I thought we had dismissed those claims. A player heads to an area where "an ancient evil" (or equivalent deadly cliche) poses a grave threat to the area and the entire town/city/state/region/world. Your adventurer fights and prevails in a hard-fought battle. 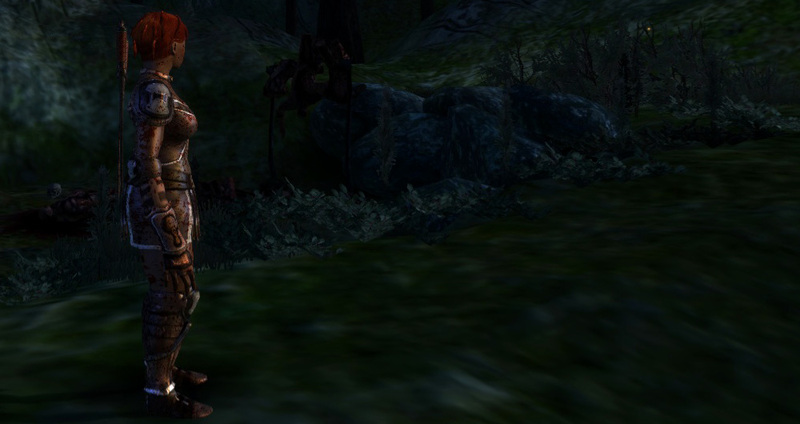 Yet a few levels later, "grunt" enemies actually present a greater physical threat to the character because of the levelling system. 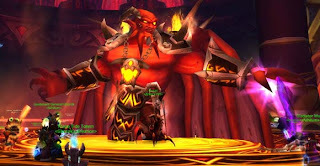 Plus, unless the designer makes an effort to place in some battle with unlevelled enemies, that player may not get the feeling over becoming overwhelming powerful. 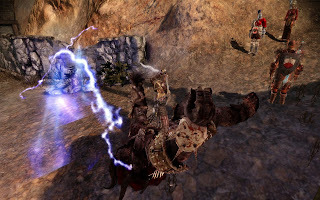 Again, I'll level some criticism at Dragon Age (Yes, I'm a rabid BioWare fanboy, but that doesn't mean I can't see faults in their games) for some of the battles near the end of the game when you were fighting "one-shot-kill" enemies. 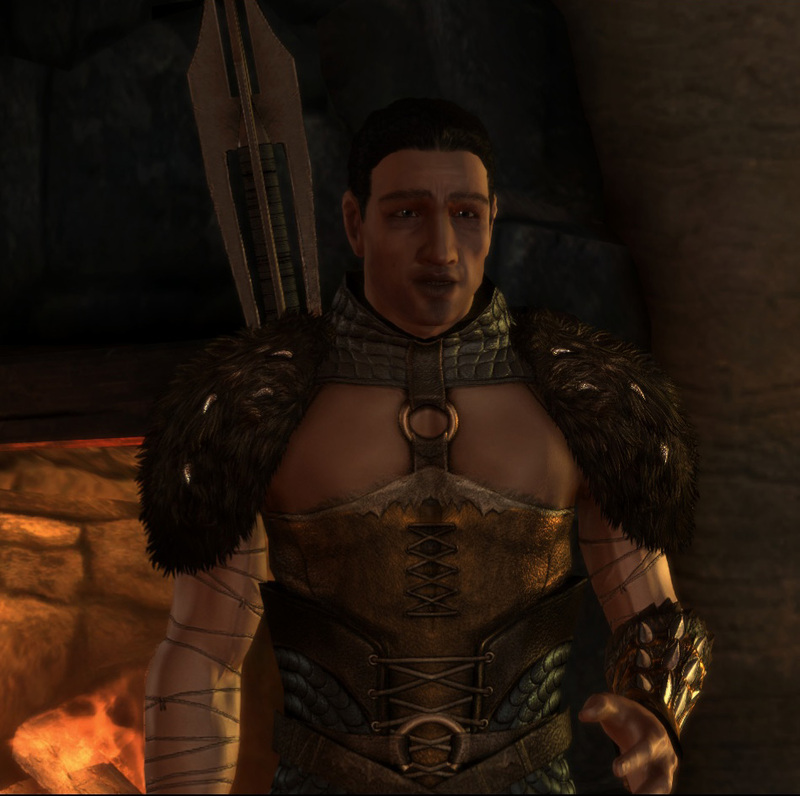 This didn't so much give you a sense of achievement that you had become powerful, but more got you thinking you'd just been sent to fight the darkspawn "B-Team". 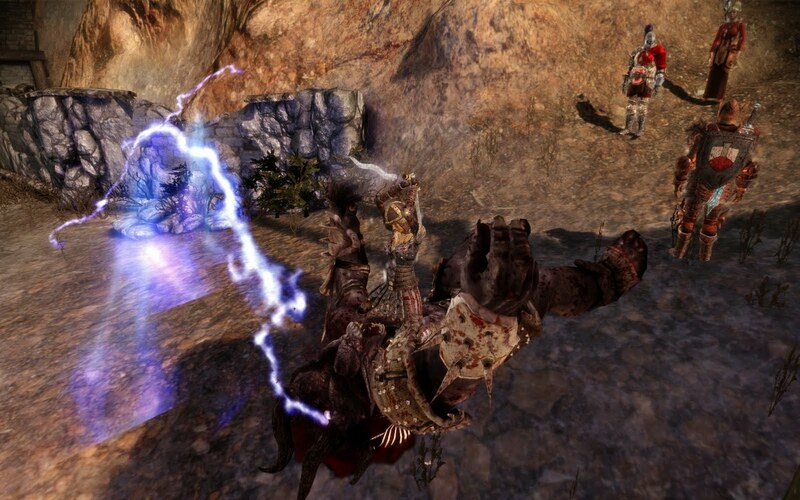 Immediately either side of a couple of battles where you were facing off against the "one-shot-horde", you had to deal with "regular" darkspawn that took a significant amount of effort to kill. Are you done yet, Leliana? It's a little boring just standing around here. Even ignoring that issue, the problem of balance is tough given the gamut of players. A quick read through forums for most games (and this isn't exclusive to RPGs) will find you reading posts both decrying the game as too easy and too hard. You'll have players who find the game almost impossible on "Easy", but others declaring it a boring cakewalk on "Nightmare" difficulty. 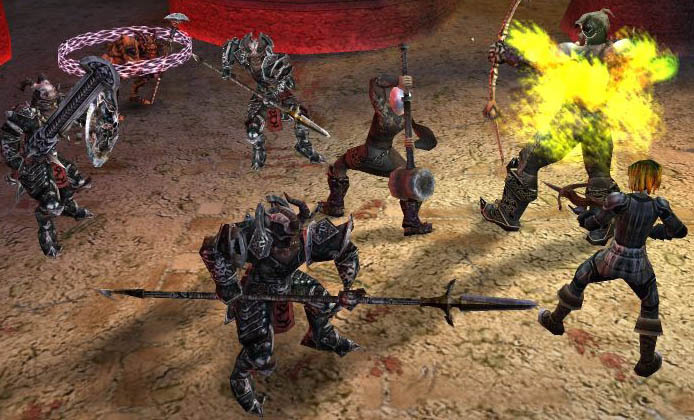 Combat is inherently difficult to balance because of the dramatically varying skill levels of players, combined with their egos and desire to play a game on a specific skill setting. Some players don't like turning the difficulty down to easy because "they're better than that" and will endure hours of frustration or even stop playing the game for a while rather than drop the game down from one of the higher difficulty levels. Some will even complain about a fight being too hard because they've been defeated easily several times but haven't thought about trying some different tactics. So there are (some of) the challenges faced by a design when presenting combat to the player. There are other issues I haven't covered (but if you feel they are particularly important, please tell me!) because it's a complex subject. That said, it is an area well worth studying, as interesting combat is probably the bulk of the gameplay of an RPG; if the gameplay is boring, the game is boring. When designing an RPG, one of the important things to balance is the distribution of dialogue and combat. Too much of one or the other can alienate a large number of players, and gamers are a very fickle bunch. It will probably come as no surprise to many readers that I have a huge hankering for dialogue when it comes to RPGs. It's why I've designed quests previously that involve no to little combat, because I love presenting the player with tough choices that they can't just resolve by pulling out a weapon and killing everyone. I also like having stories related to me about the lore and history of the world, and will explore them whenever I can. However, I'm also aware that many players would prefer to avoid those types of conversations entirely. Quests and favors and missions, oh my! Generally, players don't mind doing "small" tasks every now and then, as they (should!) provide short and interesting diversions from the over-arching plot. Even better, some of them might even tie in to the main plot later on. Yes, some people are going to love having a huge list of things to do, but it's not good practice to alienate the majority for the sake of a few. Another problem with dialogue is that it is time-intensive. The amount of effort required to provide players with interesting and meaningful choices to resolve situations, and have the NPCs react in believable ways to their actions takes a lot of effort. Compare writing 100-200 lines of dialogue and associated scripting to laying down a few dozen monsters throughout an area. It's likely that players will get around the same amount of play-time out of the two, yet the latter takes significantly less time for the designer. Naughty, nice, neutral or in-between. Option overload? Writing time is increased for each choice the designer gives the player. Taking the example from my NWN2 mod Fate of a City above, each player option demands a different response from the companion Kyandra. The conversation will branch out and then trunk back in to a "core" set of choices, but there's at least 4 lines of dialogue that the player will not see in a single playthrough - and that occurs for a large percentage of the choices that the player is given. Multiply that by every conversation choice the player has, and the amount of time to do the writing alone increases dramatically, let alone the subsequent proofreading and playtesting. Fate of a City didn't have voice acting, so it was possible to have that much choice; if I'd included it, the amount of time to record and master the cuts would have been very large, not to mention a massive increase in download size. 140,000 words of voice acted dialogue would be a huge undertaking. In summary, dialogue takes a long time to write, even longer if you're doing VO, and some players are bored by it - yet it's a crucial part of an immersive RPG. PS Yes, I know I didn't cover Dialogue vs Combat in this post, but my discussion of dialogue turned out be longer than I expected. I'll be tackling combat next, and then balancing the two. So I've been taking some time off modding (please don't lynch me) to have a little gaming fun in the form of Alpha Protocol over the last two evenings. My initial thoughts are that it's not too bad, despite some lambasting it received in a few reviews. This isn't to say that it's fantastic game, but I'm definitely enjoying it. Don't take this as a definitive review of the game, as I'm still not a long way into it, but I've racked up enough hours to get a decent impression. Obsidian have taken the cinematic flavour of Mass Effect and moved it to a modern setting, and done something that I've been waiting for in an RPG for quite some time: Smooth flowing conversation. You don't have the opportunity to analyse your decisions - they have to be made within the natural flow of the conversation. In a style akin to Mass Effect, you're given three options in conversation (occasionally you might be given a fourth "special" option, but that's not the norm). You get to pick a charismatic/friendly response (which sometimes fails and comes out as sleazy), a blunt/aggressive response, or a professional 'to-the-point' response. Your choices are presented as a one-word option which gives Mike Thorton (your character) the "style" of response he should give. It makes the conversation flow very naturally, and makes the role-playing aspect of the game much more natural and immediate. For better or for worse, this also means no "skipping" of dialogue. It definitely adds to the cinematic feel - it's the FIRST game on which I haven't turned subtitles on, so that's saying something. The choices also appear as though they will have some real tangible effects on the game as it progresses, which earns big points in my books. Outside of the dialogue, the game is a stealth shooter. Unfortunately, this is where the game falls down a little, as there are a number of polish issues that let the game down. The first is a pet hate of mine: magically appearing enemies. Personally, I consider this terrible game design, especially when enemies appear in areas behind you that you've already made sure are clear. Unless your game is in a fantasy or sci-fi setting that allows teleportation, enemies must not magically appear out of thin air. It's that simple. They also should not disappear... which has happened on a few occasions, most frequently after loading from a save. The shooting/aiming mechanic is a bit average, requiring to "lock on" to a target for a long time to line up your shot. It's also possible that you won't kill an enemy with a headshot - though it's not as bad as the stupidity that was a juggernaut in Modern Warfare 2. There's also three minigames: hacking, lockpicking and security bypass which actually aren't too bad. The variety means you don't get bored with repetition a la BioShock's pipemania, and the difficulty is high enough that you're definitely on your toes while doing them. Some people have also complained about the graphics, and I agree that they're not great, but they're certainly not "PS2 standard" like some reviewers have erroneously complained. I'm reaching the point where the complaints of "bad graphics" in games are starting to annoy me - as though everything has to have graphics like Crysis, Mass Effect 2 or a CG movie. I'm a big fan of stealth, and so I attempt to use it in games whenever possible. Typically, it's not useable because enemies spot you from half a mile away behind cover, you know the games I mean. How no one has managed to implement stealth at least on par with the original Thief, which is now many, many years old, I'll never know. So, stealth in Alpha Protocol? Well, it actually works. There's no fancy use of shadows, as you stay hidden merely keeping obstacles between you and your enemies while crouched, but it is actually a serviceable mechanic. It's just unfortunate that Mike looks ridiculous (and that's probably being kind) while walking around crouched. Again, it's by no means perfect, and occasionally you'll get sprung when you shouldn't (magic enemies as a prime culprit), but it is functional, and that alone makes me happy. So overall, from what I've played I'd call Alpha Protocol an interesting and enjoyable game. It's unfortunate that Obsidian have sold themselves short by not delivering a polished product, but it is still good, despite some irritating flaws. 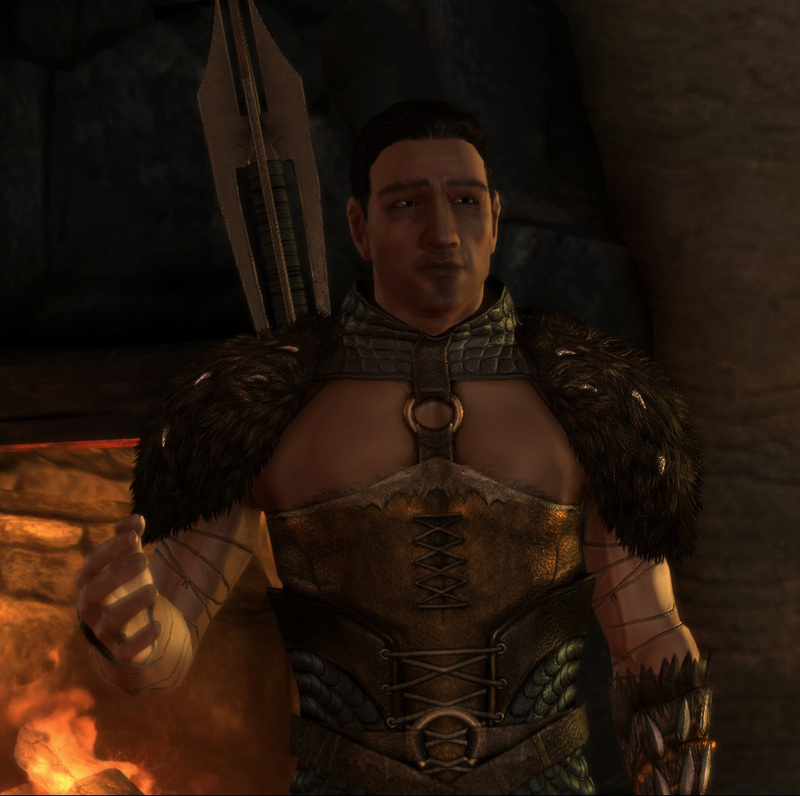 Don't expect a shooter, it's not one, and don't expect a dialogue heavy epic like Dragon Age, because it's not that either. It might walk an unhappy medium for a lot of players, providing neither the depth in either category, but for me, it borrows from several genres I really like with some fresh ideas. Some minor annoyances occupied too much modding time this evening, time which had already been cut short by seeing the new Prince of Persia movie. While I could point out a number of weaknesses in the movie, I think it might actually be the first "good" movie based on a computer game. Aside from that, I was able to do a little bit of plot management, scripting and some short cutscene work. Doing real cutscenes involving camera movement and animation is time consuming - I certainly don't consider myself a director by any standards, and I doubt I will turn into one any time soon. Still, by keeping camera cuts short (even though I often hate that in directing) I can convey information quickly and without hours of effort on my part. My main hope is that it is effective in helping to tell the story and show some action.